Back in February I was staying there (in the town that is, not the chocolate shop) whilst house hunting & one afternoon wandered into the small shop that sits in a side street in the rabbit-warren of lanes that is the old town. 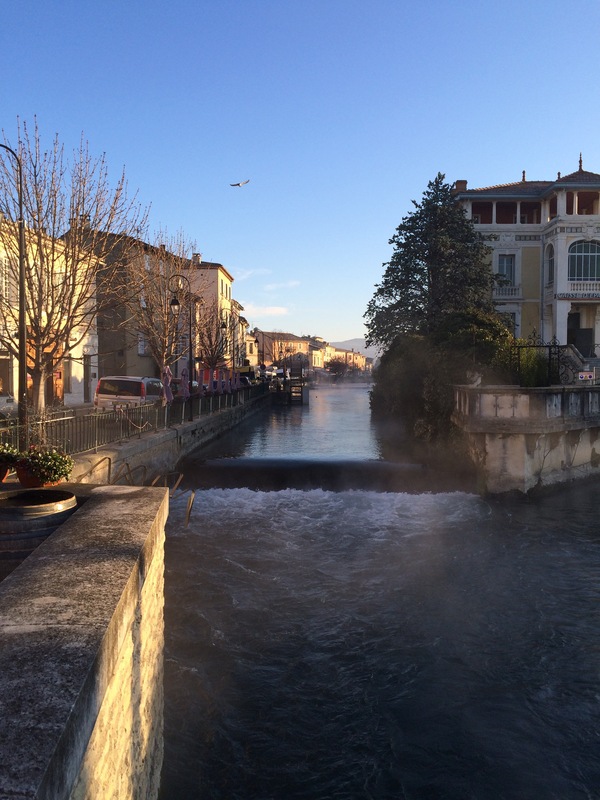 l’Isle sur la Sorgue in mid February – chilly but worth the trip! I had been past the shop many times, but hadn’t been in – in hindsight that had been a big mistake! I’ve always loved the images Joanne Harris created in her novel ‘Chocolat’ where the chocolatier, Vianne knows which chocolate is going to be ‘the one’ for each customer. 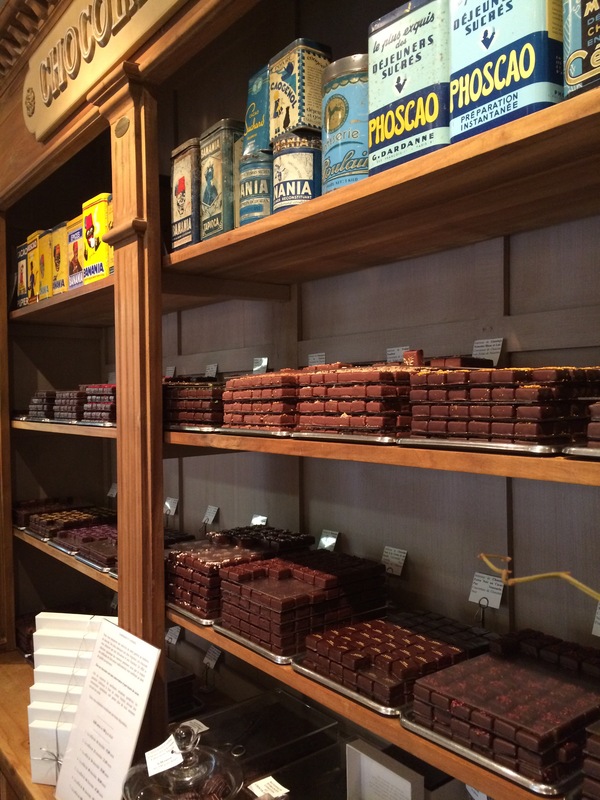 The detail of the smell and the whole ambiance of the shop where…..
…….. and after visiting many chocolate shops over the years (all in the interests of research of course) La Cour Aux Saveurs is the closest I’ve come to finding it! The first thing that hits you when you walk in is the smell – it (understandably) smells of chocolate -not the nasty artificial scent that is sometimes pumped out in shops, but a rich intoxicating smell, so thick that you can almost taste it. 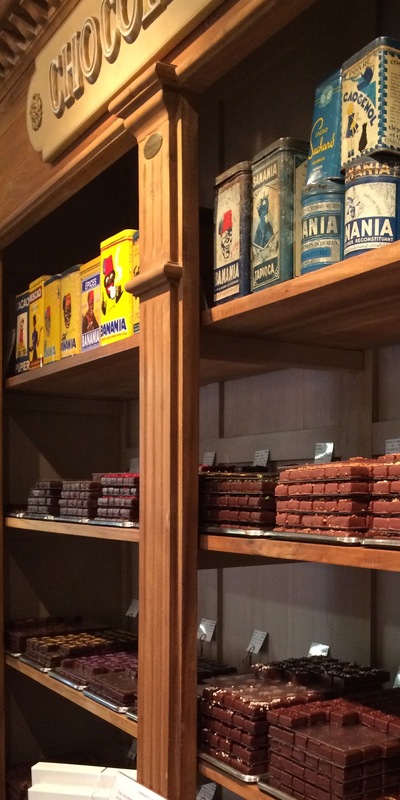 With the walls filled with chocolate like this it’s easy to understand why it smells so good! The shop itself is run by a lovely couple – Monsieur ‘le chocolatier’, Florian Courreau, who I have always seen dressed impeccably in whites. He is inevitably hard at work in in the pristine, gleaming kitchen (or perhaps chocolate workshop), which is on open view from the busy little shop area, which is managed by his wife. 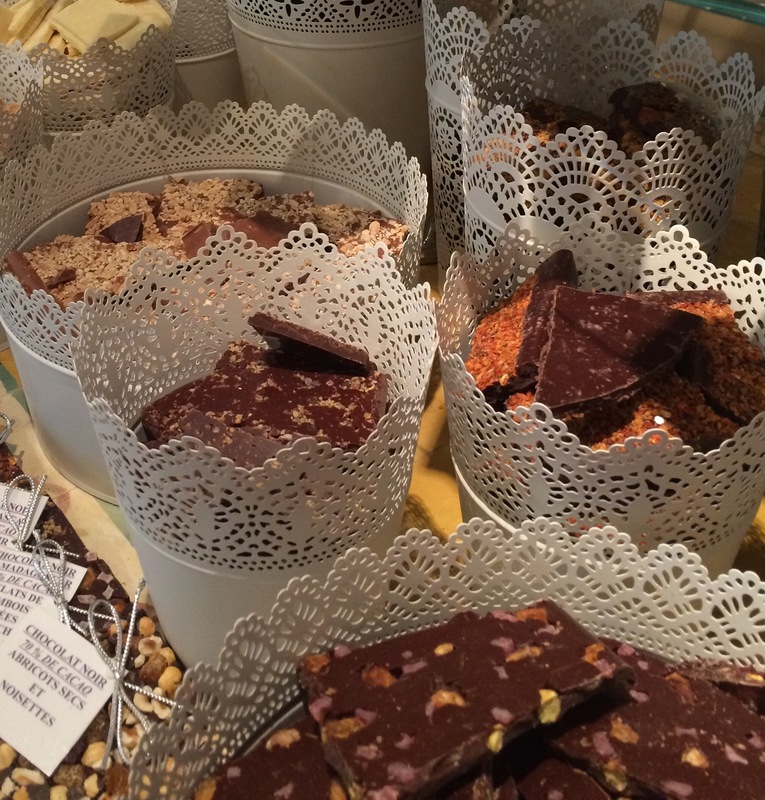 The shop has everything a chocolate-lover could want, from a variety of chocolate pyramids…. 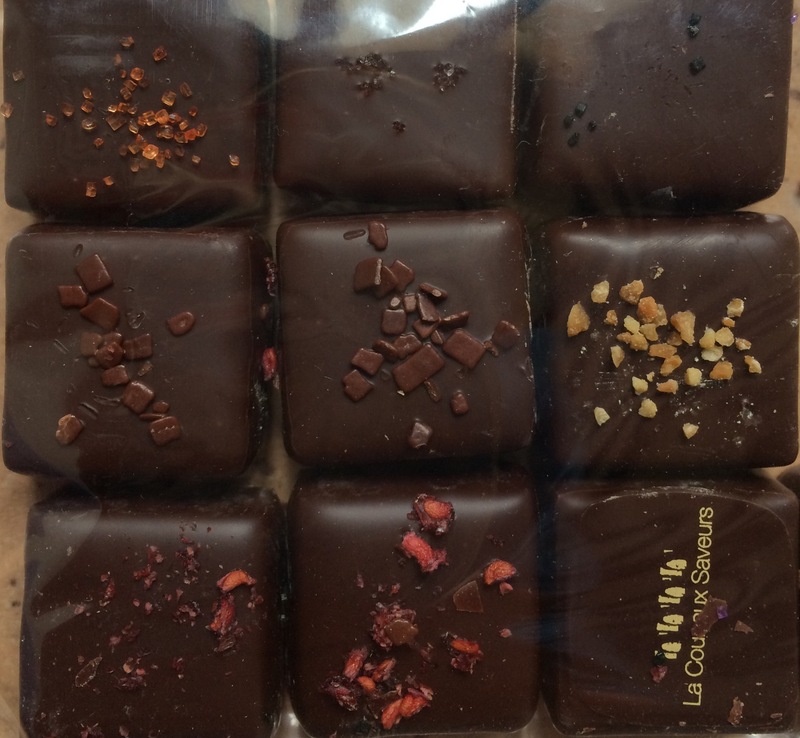 and huge slabs of milk & dark chocolate studded with nuts and fruit, which have been broken into more easily manageable ‘shards’…..
to beautifully made glossy individual chocolates, each infused with a different flavour. Of course there are other things to tempt anyone with a sweet tooth, including the fruit ‘cheeses’ that are a local speciality, but for me it’s all about the chocolate. 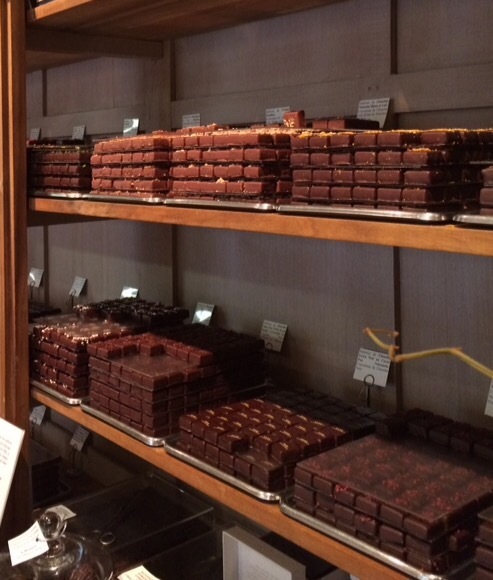 The little individual chocolates cost 8€ for 100g (about 12 chocolates) and it’s nice to take some time working your way along the shelves that are packed with small piles of gleaming squares, deciding which flavours to pop into the bag. With so much choice the hardest part is where to start? The nice thing is that you’re never rushed and the lady in the shop is always happy to explain each flavour – from Caramel (fleur du sel) to Lavender and some more unusual ones too! There are always tasters available to help you make your decision or to encourage you to try something a little bit different. 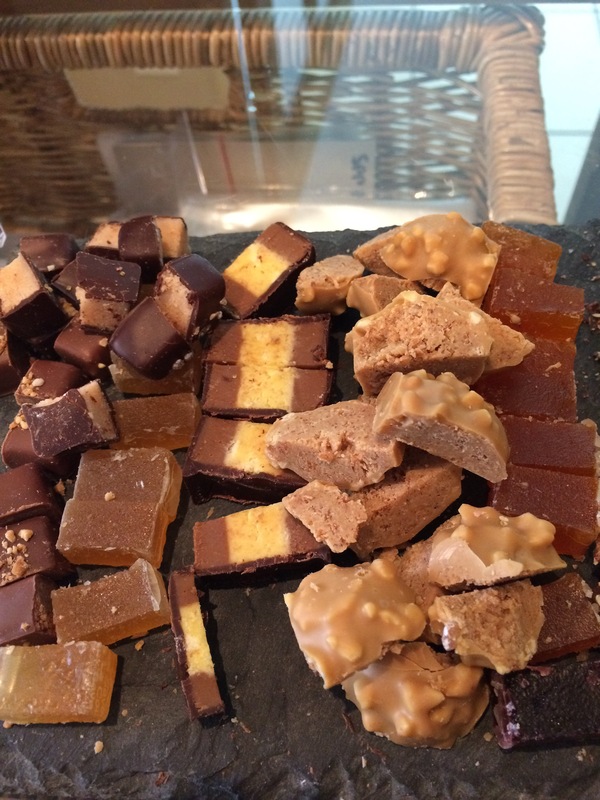 Tasters on offer when I popped in yesterday- I can vouch for them all! When you leave you’re given instructions on how to keep them at their best – they will last for 3 weeks (I must admit they’ve never lasted long enough for me to test this out!) and most importantly never put them in the fridge. One thing is for certain – it is always money well-spent. Each chocolate is worth savouring, the initial resistance of the outer shell, followed by the rich, flavoured ganache or other centre (mint being one of my favourites!) How I could go on!! So if you find yourself in L’Isle sur la Sorgue & after a day around the market or a few hours Antique hunting & you fancy a sweet treat then I can recommend just sneaking off down a side-street & spending a few minutes buying some chocolate – if you’re lucky no one will know you’ve bought them & you won’t have to share!! Perhaps with the temptations on offer to lead you astray this really Vianne’s shop from the novel? Previous Post Bring on Winter – the woodburner has been fitted! Oh my.. I must go! Immediatement. 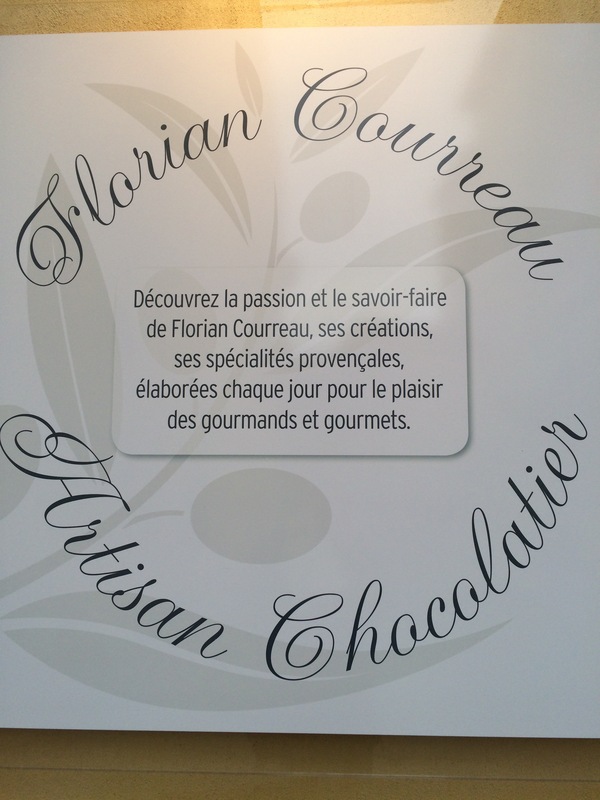 I love caramel fleur du sel.. yum! As I don’t have my own blog I tend to read but not comment on those that I follow. As a Francophile and particularly one who loves Provence, yours is one of several French related blogs that I follow and up until today I didn’t feel able to make a comment! Back in the summer our family were out for a days cycling (Friday 12th August at around 14.00), having a picnic lunch at Pont St Julien when you cycled past heading in the direction of Apt – what are the chances??!!!! Your bicycle is pretty distinctive! The reason for mentioning it now is that we are this week staying in Lourmarin and this morning another French blogger popped into the local café where we were having morning coffee. She is British, living in San Francisco. Again – what a small world it is in the blogging community. Pretty amazing……. Wow that’s incredible & how lovely to hear from you. I’d been over to L’Isle Sur La Sorgue that day for the first day of the Arts & Antiques Fair to source some pieces for my jewellery business & was heading back with a basket full of bits! It’s so nice that you have come across another blogger too – we’d normally be at Lourmarin this morning for the market, but as it’s such a lovely day we’ll be heading off on the bikes again – we’re back over at the moment so Miss Daisy has been having a few more outings, although minus basket this time! If you happen to see us again when you’re over please say hello !